No fuss! You get an airline approved crate, enough metal nuts and bolts for this crate, the proper amount of live animal labels, Dry Fur pads, enough cable ties, food and water bowls that fit the door, pet ID tags, Everything! We put it all together make it easier on you and your pet! 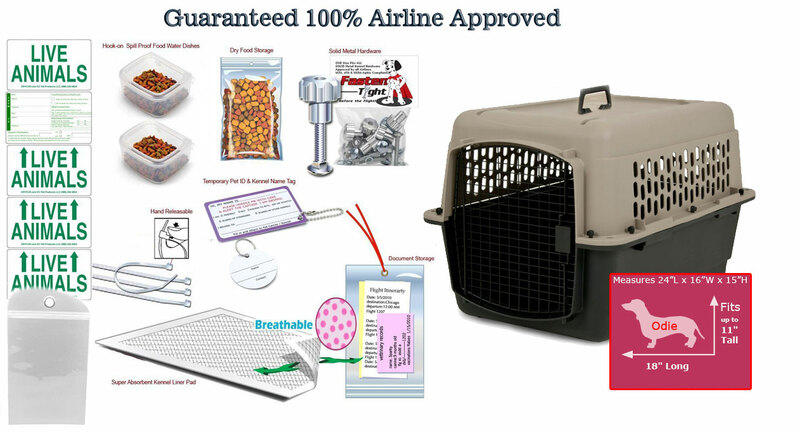 OUR (ALL in ONE) Complete Pet Airline Kit – Guaranteed to be accepted by ALL Airlines. All the features are listed below. 1/1/12- NOT ACCEPTED BY BRITISH AIRWAYS due to size only! They now require a 26″ x 18″ x 19″ or Larger, so if you are flying British Air please look into Our Buddy Package. We had to bring 2 cats from US to India. There were a lot of hoops we had to jump through. One thing we didn't have to worry at all was the carrier. It had everything required by the airline. Above all this company has excellent customer service. I had to call in to cancel my order and they returned my money without a question. I would recommend this product and this company to others in a heartbeat. I purchased the Odie Crate PK plus 2pk DryFur Deluxe. I am very pleased with the product. The "kit" contained everything I will need for my international trip. In addition, the company has outstanding costumer!